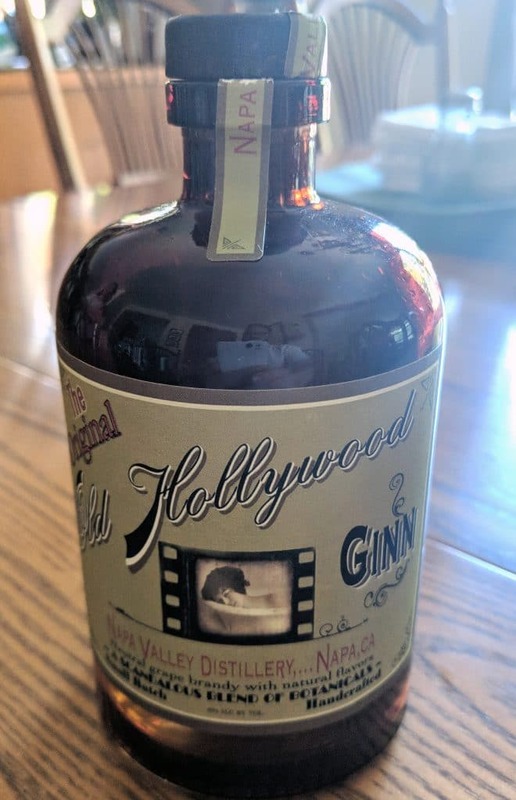 Napa Distillery’s Old Hollywood Ginn— that is using two “N’s” instead of one is intentional. This is to differentiate their product from the one N type of gin. Legally, their technique does not meet certain requirements for what constitutes a gin†. Technically speaking though, Old Hollywood Ginn is a compounded gin and therefore I believe that legal nuance aside, should be considered as a gin. The spirit starts as an unaged grape-base brandy. It then adds nine botanicals (juniper among them) and American Oak Chips for a maceration process of unspecified length. The botanicals and chips are filtered out and Old Hollywood Ginn is bottled with a cloudy, sepia tone. According to this write up at The Complete Gentleman, Napa Distillery uses a technique found in an 1868 guide called The French Wine and Liquor Manufacturer: a practical guide and receipt book for the liquor merchant, being a clear and comprehensive treatise on the manufacture and imitation of brandy, rum, gin and whiskey. Therein John Rack provides several recipes for flavoring brandy to approximate gin using oils and other flavoring agents. The nose of Old Hollywood Ginn is rife with spice. Anise, licorice, spiced orange and very sweet cinnamon suggestive of candy. It also has a lot of clove notes. It reminds me a lot of Verbatim Gin 1495. The palate of Old Hollywood Ginn is rich with clove. There is a lot of clove flavor here. But it also rounds things out with cloves, a subtle spicy/piney juniper and some delicate hints of fresh grated allspice berries. It’s similar in approach to other compounded gins like Tru Gin in terms of botanical strength, but the spice character is so strong in Old Hollywood Ginn that anything of note from the oak chips is obscured. Compounded gins in general from this method can be hard to mix. It’s an extraordinarily peppery and piquant Gin and Tonic, but it may have some appeal in an Aged Gin Old Fashioned for fans of spice-forward contemporary gins— and those who don’t mind an unusual color in their drinks. Whether Ginn or Gin, Old Hollywood Ginn is a spice-forward drink no matter how you cut it. Unfortunately, it lacks the balance you might expect from a commercial product. If the idea behind Old Hollywood’s creation appeals to you, you may just want to experiment with a make your own gin at home kit. Those use the same technique and ultimately you have more control over the flavor. † Technically speaking, Old Hollywood Ginn is officially categorized as an “Other Specialties and Proprietaries” by the TTB.